Orange County Mayor Teresa Jacobs lauded the continued success of the Division of Building Safety’s customer-centric, One-Stop Permitting Office during the Division’s recent annual staff meeting held in the Board of County Commissioners Chamber. The Mayor went on to commend the team regarding the quantity of positive customer feedback and compliments the County has received about the staff’s exceptional work and customer service. Following the Division of Building Safety staff meeting, Mayor Jacobs joined several team members in an interactive tour at the construction site of the new, luxury apartment homes, The Courtney at Universal Boulevard. She participated in the inspection process while staff informed her about the details involved in performing safety inspections of soon-to-be homes. “The goal is for the Mayor to understand the extent we go to in order to inspect and ensure the safety of buildings,” said Alan Plante, a building official for the Division of Building Safety. 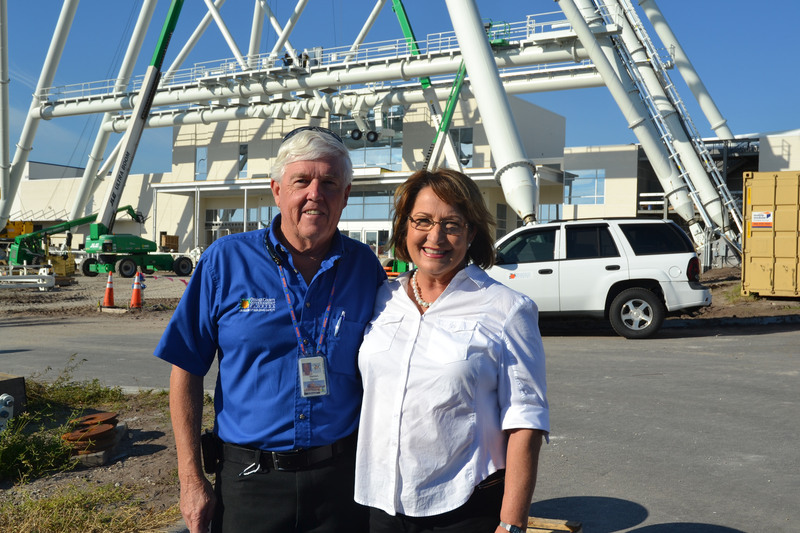 The group continued the field visit with a stop at another inspection location, the I-Drive 360 construction site of the 400-foot-tall Orlando Eye. Mayor Jacobs was safely lifted by crane in a construction crate to take a closer look at the massive inner wheel. The observation wheel’s air-conditioned cabins will be able to hold dozens of guests in each car, offering them a bird’s eye view of Central Florida. The observation wheel will become part of the I-Drive 360 entertainment complex, which includes headlining attractions like the Orlando Eye, Madame Tussauds Orlando Wax Museum and the Sea Life Orlando Aquarium, as well as other unique shops and restaurants. The site is located on International Drive, just north of the Orange County Convention Center. A collection of photos from the I-Drive field visit are available on Flickr for use by the media.